The Wings of Honneamise, Studio Gainax’s debut film, opened in Japanese cinemas in March 1987, just over a year before Akira. While the films are very different, they share common ground; they’re both anti-establishment SF movies which could be made in lavish style, thanks to Japan’s national prosperity in the 1980s. Those were the country’s bubble years, and Honneamise and Akira splurged on bubble money to break with Japanese animation practices. They didn’t deliver franchise tie-ins or family entertainment. Instead they served up intense visions of society and humanity, sold not by merchandise but incredible screen spectacle. Honneamise tells the story of a young man, Shiro (short for ‘Shirotsugh,’ though his nickname is handily Japanese). He lives on a world whose culture and technology differ from ours in intricate ways, in the smallest details of costumes, tableware, street lights. Shiro’s world hasn’t conquered space; its “Royal Space Force” is regarded as a pitiful place for geeks and freaks. Yet Shiro finds himself volunteering to be the world’s first astronaut, for the most adolescent of reasons – an urge to impress a beautiful woman. The film can be read as a grandiose statement on human nature, and on humanity’s drive to rise, to fly. It can be also be seen as a self-portrait of its creators, of fanboys who were suddenly given the resources to create their own masterwork. The team who’d make Honneamise and found Gainax came together in the early 1980s. They made stunningly elaborate fan animations for the Daicon convention in Osaka, where a bunny-suited girl fights mecha, Aliens and Darth Vader. Another important training ground was Macross in 1982 (reworked into the first arc of Robotech). 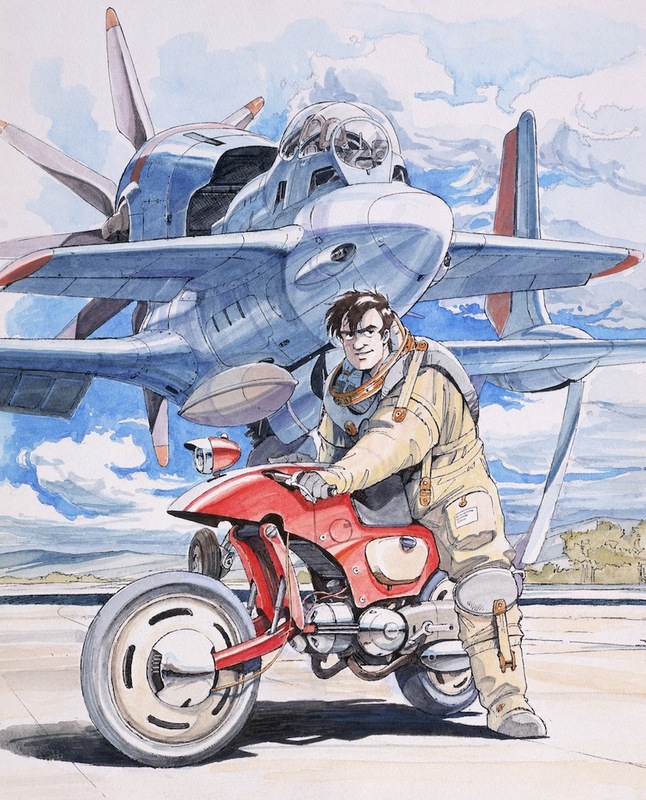 Hiroyuki Yamaga, Honneamise’s future director, designed the storyboards for Macross’s title sequence, in which a jet takes off from a carrier. The image is seemingly referenced in the pre-titles prologue of Honneamise. Hideaki Anno – yes, that Anno, future creator of Evangelion – was a Macross animator, specialising in mecha and explosions. He especially loved exploding objects, tracing the paths and patterns of debris through the air. Macross would become a decades-long franchise, following the precedents of Gundam and Space Battleship Yamato. In Anime: A History, Jonathan Clements suggests that Bandai, the film’s financial backer, hoped to bootstrap a similar franchise with Honneamise. Indeed, Bandai owned the Sunrise studio, home of Gundam. No doubt Bandai had high hopes for Honneamise merchandise – the Gainax team had a track record in creating homemade garage kits. For such reasons, Honneamise ballooned from a low-budget video anime into a costly feature film. 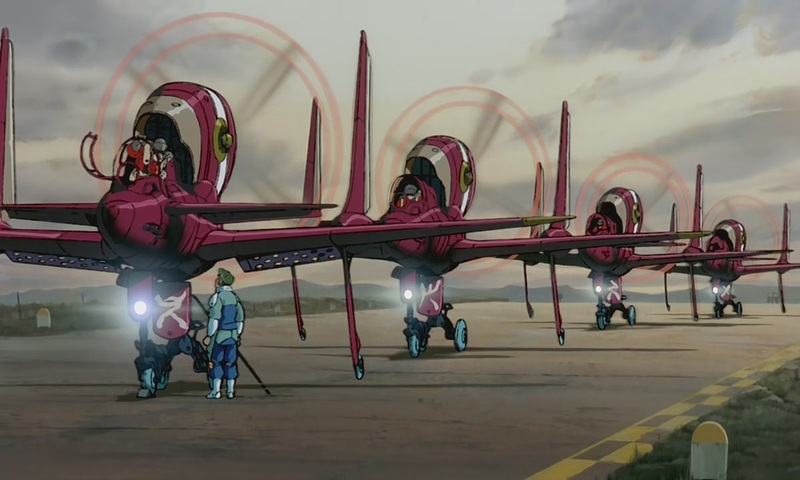 Clements notes that by the time it entered production, it had picked up a raft of sponsors and investors, including an airline which insisted that the film’s title include “Wings.” It was given a budget of around $8 million (including $5 million from Bandai), a tremendous sum for Japanese animation at the time. The Oscar-winning composer Ryuichi Sakamoto was hired, writing four main themes that were complemented by music from two other composers. Yamaga also recalls driving the Gainax artists to create an imaginary civilisation systematically, from the ground up. For example, if they were designing a glass of water, they shouldn’t just go for an “interesting” design, but think about the basic purpose of the glass – to hold water – and reconceive it from there. “I urged all the staff to go through that kind of thought experiment… I adjusted their brains to ‘Honneamisish,’ Yamaga said. The film became a very adult drama about an immature protagonist who often drifts, is passively impressionable, and turns out to be shockingly flawed. There are obvious comparisons to Gainax’s later Evangelion, with its neurotic hero Shinji. Ghibli’s Tales from Earthsea also had a lost protagonist in a lost world. But it was a risky kind of story. Earthsea was hated by many viewers, while Honneamise may have baffled them, judging by the film’s modest cinema box-office in Japan. Okada added that Honneamise didn’t connect with anime fans in Japan either. “In those days, Project A-Ko was what most fans thought of as good, and such money-making anime was the type promoted in the industry, which put Honneamise in a difficult place.” Ironically, Project A-ko’s writer-director Yuji Moriyama served on Honneamise as an animation director. 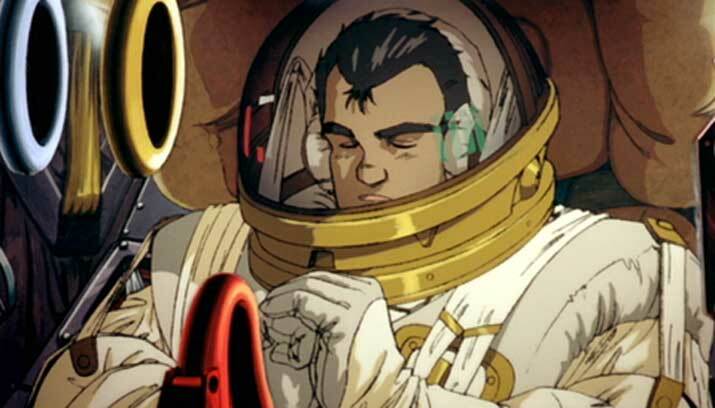 In America, Honneamise could have been buried in a travestied dub (as Nausicaa was with Warriors of the Wind.) The first US version was called Star Quest; it changed character names (Shiro became “Randy Wilson”) and mucked with characterisations. Mercifully, Star Quest quickly vanished and a more faithful dub of Honneamise was created by LA Hero. During production the company was bought out and rebranded as the American arm of Manga Entertainment. The dub’s lead actors (Robert Matthews and Melody Lee) appeared in only a few anime, but there are some very familiar voices in bit parts, including Richard Epcar, Steven Blum and Wendee Lee. Matti, one of the film’s supporting characters, was voiced by Bryan Cranston, long before his world fame in Breaking Bad. The dub script, however, still takes liberties with the original, though nothing as atrocious as Star Quest For example, Shiro’s final speech in the film has a notably different tone in the dub and sub versions. In contrast to its reportedly lukewarm reception by Japanese anime fans, the film was enthusiastically embraced by their American counterparts. Many of them had been wowed by Akira, Honneamise’s successor, and now found that Gainax’s film treated SF in a far lower-key, cerebral way. But even among those fans, Honneamise was controversial for one scene. 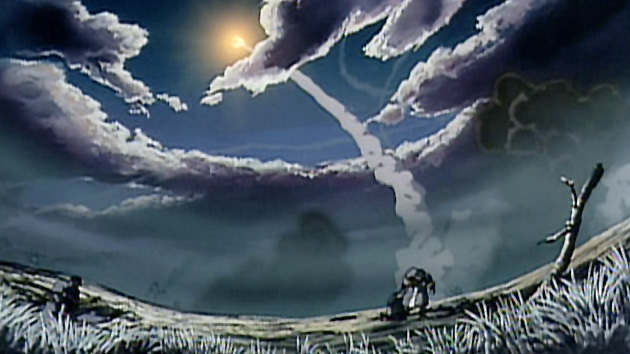 The scene in question involves a sexual assault, which many viewers found offensive and unnecessary (and arguably slightly more offensive in the dubbed version). Again, Okada blamed the screenplay for leaving the scene’s meaning and motivations unclear, and losing the audience. 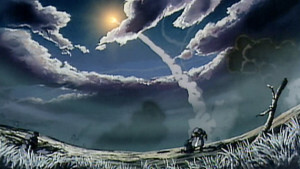 The scene was cut out of the first UK home release of Honneamise in the 1990s; Manga Entertainment made the edit voluntarily to get the film a ‘PG’ certificate. Interviewed by Manga Mania magazine, the BBFC examiner Imtiaz Karim called the scene “a wholly gratuitous sexual assault in the middle of a film which was otherwise a wonderful experience for younger viewers.” Anime Limited plans to include an option for viewers to skip the scene. Despite the controversy, Honneamise was a huge boost to anime’s international reputation. In Japan, there was no question of the film turning a profit in cinemas, but it became an enduring fixture of the video and later DVD market, with no risk of its sumptuous visuals dating. It finally turned an official profit in 1994, the same year it came to America. Studio Gainax was nearly bankrupted, but survived – because, Clements says, “Its managing director did not possess the business acumen to pronounce the company dead.” A few years later, after Japan’s national bubble had burst, Gainax made the kind of cash-cow that Bandai had dreamed of with Honneamise – Evangelion. Many fans know Gainax considered a sequel to Honneamise, although there’s some confusion in this area. 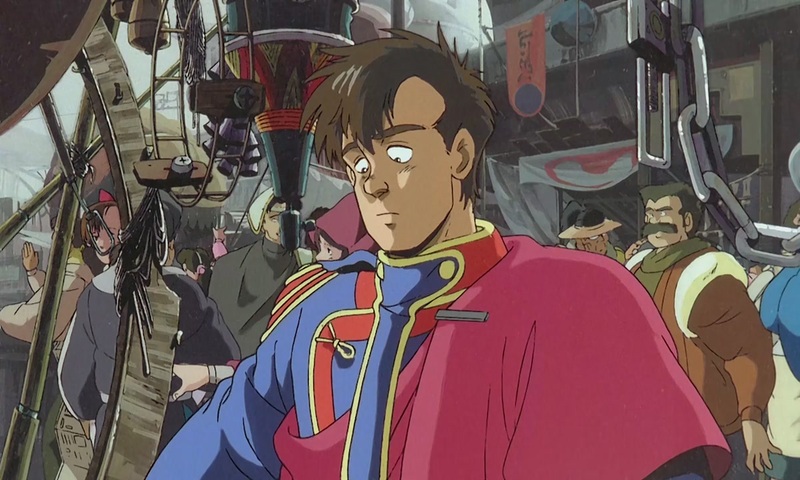 According to Animerica, Yamaga and Okada talked about a sequel set a century later, in which a spaceship from the world of Honneamise journeys to Earth in the present day or the near future. However, this idea is distinct from another planned film, Blue Uru, which may yet be made. 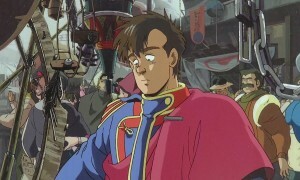 Blue Uru was conceived as a “successor” but not sequel to Honneamise. It’s the story of a plane pilot trying to save a kidnapped singer; Okada compares it to Walter Hill’s retro-styled biker fantasy Streets of Fire (1984). The anime was planned to reunite Honneamise’s core talents, Yamaga, Anno and Sadamoto. The first bid to make Blue Uru was in the early ‘90s, with several attempts to revive it in the next two decades. 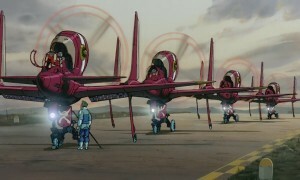 A CD-ROM of the film’s designs, including planes by Masamune Shirow and Yamaga’s original script, was released in 1998. According to an announcement in December 2014, Blue Uru is still seeking collaborators, with Yamaga (writer/director) and Sadamoto (designs) both attached. Anno, understandably, is otherwise engaged. The film’s projected budget is $40 million while the hoped-for release date is 2018, thirty-one years after Honneamise. Do its makers still have the right stuff? After decades in the business, can they still remember when they were hungry misfits, their own metaphorical space force, longing to leave Earth and enter their dreams? Andrew Osmond is the author of 100 Animated Feature Films. The Wings of Honneamise is available now in a DVD from Anime Ltd, and as a Blu-ray/DVD Collectors Edition combi-pack later this month.